Revised January 2016. An earlier version of this paper was presented at COP21 in Paris and published simultaneously by the JEI on December 1, 2015. Saskia Feast, President, Feast Focus. * Corresponding author email: jmadden[at]eosclimate.com, phone: 1.650.224.1676 988 Market Street, Suite 600, San Francisco, CA, 94102, USA, fax: 888-358-1339. The production of commodities contributes a significant portion of anthropogenic greenhouse gas (GHG) emissions globally and presents a particularly difficult challenge for policy makers and multinational companies working to address emissions within the global supply chain. A simple mechanism is needed that enables commodity producers to benefit financially from taking action to reduce emissions, while it also enables market participants to demand carbon efficient commodities at the base of the supply chain. Rather than create an entirely new approach, we have designed a system that leverages technology to integrate standards, audits, and financial flows to enable the existing global market infrastructure to differentiate and value low-impact commodities. Of the numerous environmental externalities associated with commodity generation, carbon risk has emerged as a driver in capital markets. This concept paper introduces the Carbon Impact Factor (CIF): a family of financial instruments that allows market participants to incorporate the carbon efficiency of a commodity into purchasing decisions and communicate associated carbon mitigation to stakeholders. While the focus of this effort is carbon, the principles can be applied to other externalities, such as water depletion, social and land use impacts, and beyond markets to include policy and regulatory mechanisms. Taking a systems perspective, we can apply proven technologies with established precedents in environmental standards and commodities and address the capital markets’ drive to quantify and minimize carbon risk in global markets. We have conceptually designed a family of low-carbon financial instruments that is apolitical, cost efficient, scalable, extensible, and relevant and that possesses market-worthy integrity. The solution allows buyers of commodities to invest in low-carbon production practices and rewards the producers that implement those low-carbon practices. The Carbon Impact Factor (CIF): a family of quantified, serialized, cryptographic, blockchain-enabled financial instruments to quantify and value the carbon efficiency associated with the sourcing and production of various commodities. The CIF combines components of RECs, carbon offsets, carbon insets, and sustainability certificates to create a new form of efficiency currency that can be quantitatively valued in commodity sourcing decisions. Further, CIFs can be purchased by multinationals to demonstrate and communicate their efforts to reduce carbon intensity (risk) within their supply chain. CIF is not a carbon offset, nor a carbon inset. It is a measure of carbon efficiency. The unit not only incentivizes the production of each commodity with carbon efficiency as a consideration, but it also incentivizes the selection of commodities with higher carbon efficiency. The team contributors have expertise in standards development and quality assurance; GHG emissions reduction quantification; GHG measurement, monitoring, reporting, and verification methodology development; environmental commodities; commodity markets and trading; and supply chain data, blockchain technology, and cryptocurrency. Through collaboration and the application of systems thinking, the team has developed the conceptual solution presented in this paper. Scientific consensus is that the global climate system is on the verge of change unprecedented in human history due to the increasing concentration of greenhouse gases (GHGs) generated from human activities. Global temperatures have steadily increased from pre-industrial levels, already reaching the halfway point towards the “danger threshold” of a 2°C rise. The global community—governments, businesses, nongovernmental organizations, and citizens—are aligned in the understanding that GHG emissions must be significantly reduced to stay within a carbon budget. There is also widespread agreement that any effective strategy will involve a market-based mechanism that puts a price on GHG emissions. Since initial publication of this concept paper, both the carbon budget and the use of market-based solutions were supported in the Paris Agreement. Specifically, governments reaffirmed their commitment to keeping the increase in the average global temperature to below 2°C above pre-industrial levels, while pursuing efforts to limit temperature increase to 1.5°C. Article 6 of the Agreement included provisions for approaches on international cooperation and transfer of GHG emission reductions, such as those provided by market mechanisms. To date, international climate negotiations have focused on commitments by national and subnational governments to gradually reduce emissions, primarily from direct downstream sources (for example, power plants, energy-intensive manufacturing, and motor vehicles). These types of top-down government regulations and policy measures, however, will typically not be able to effectively address upstream GHG emissions (for example, from the extraction of raw materials and subsequent transformation into products) because supply chain emissions are indirect and often associated with activities beyond national and subnational borders. Multinational corporations working to manage their GHG emissions face a similar challenge with indirect upstream emissions from supply chains. CDP (formerly the Carbon Disclosure Project) provides a global system for companies and cities to measure, disclose, manage, and share vital environmental risk information. CDP incorporates three categories of GHG emissions as defined by the World Resources Institute (WRI) and World Business Council on Sustainable Development (WBCSD). The majority of companies report only their direct emissions (Scope 1) and those from the generation of purchased electricity (Scope 2), with a much smaller percentage reporting indirect emissions that occur in the supply chain (Scope 3). 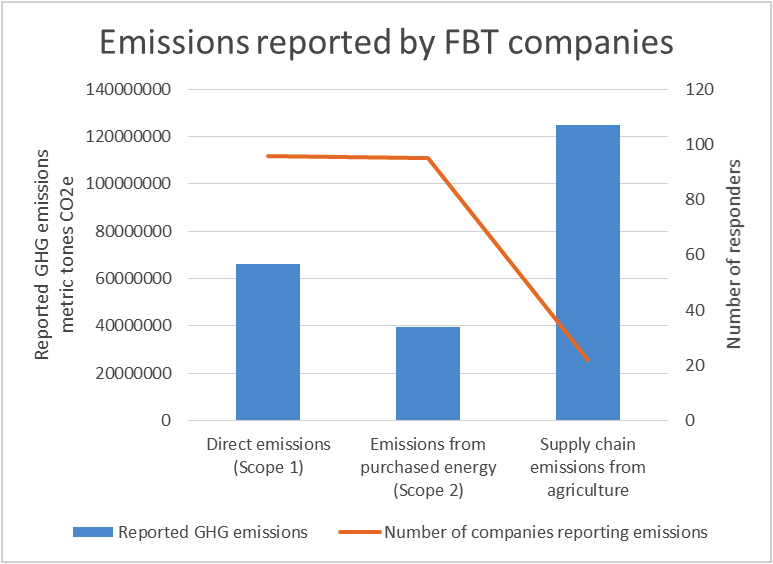 For the Agricultural sector, the number of entities reporting scope 1 and 2 emissions is inversely proportional to the Scope 3 emissions (highlighted in Figure 1). This reporting profile is typical across numerous commercial sectors. Note on the “Supply chain emissions from agriculture”: Reported agricultural GHG emissions are in the range of 108,755,112- 125,060,047 metric tons CO2e based on extrapolations from CDP data. Source: The forgotten 10%: Climate mitigation in agricultural supply chains; Maia Kutner, Director of Technical Reporting, CDP, September 2015; original p .23; PDF p. 10. The challenges in Scope 3 reporting are in part due to variability across supply chains. For example, a recent analysis of different petroleum oils from around the world found more than an 80 percent difference in their lifecycle GHG emissions per barrel (Figure 2). Similar variances in total GHG impact are seen in agricultural and industrial sectors as well. Note: Unlike the other OCI test oils, Cold Lake dilbit is not comprised of a full barrel of oil. It is about 75 percent bitumen mixed with diluent to allow it to flow. 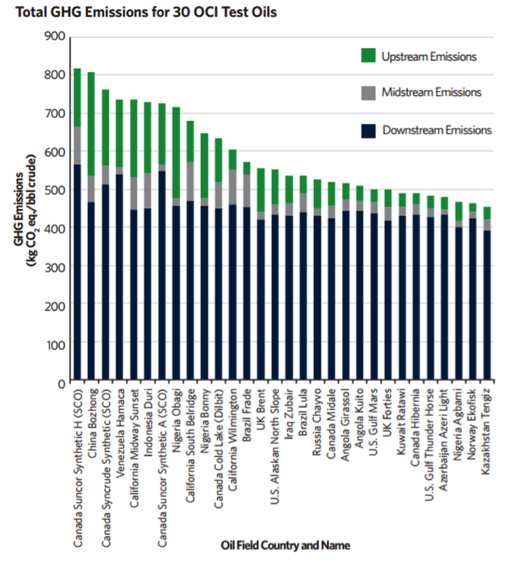 Source: Graph and authors’ calculations from Figure 12 “Total GHG Emissions for 30 Phase 1 OCI Test Oils” from Know Your Oil: Creating a Global Oil-Climate Index by Deborah Gordon, Adam Brandt, Joule Bergerson, and Jonathan Koomey; Washington, DC: Carnegie Endowment for International Peace; March 2015; p. 36. http://carnegieendowment.org/files/know_your_oil.pdf. Furthermore, the supply chain itself is generally divided into multiple Tiers (see Figure 3). In this example, Tier 4 is both the furthest from corporate operations and has the highest environmental impact. The lack of Scope 3 reporting reflects that the complexity of accurately quantifying, managing, and reporting GHG emissions increases with distance from corporate operations. For raw material inputs, which occur in Tier 4, this difficulty is compounded by the fact that, in almost every instance, raw materials from multiple origins are aggregated and co-mingled at a primary processing point, after which they move undifferentiated in the value chain. These same challenges, however, present an important opportunity. While undifferentiated in global commodity markets, raw materials are not created equal when it comes to overall impact. This includes both the GHG emissions associated with the actual raw materials and those associated with their extraction, production, and processing. Although efforts are being made to create one, currently no scalable mechanism exists for multinationals or commodity market participants to effectively manage GHG emissions at the base of the supply chains. For perspective, if we look at just six “commodified goods” (concrete, natural gas, refrigerants, palm oil, motor oil/lubricants, and iron and steel), GHG emissions are projected to be in the tens of billions of mtCO2e between 2015 and 2040., , ,  In each case, there is variability in GHG impacts relating to the sourcing or processing or both. If the respective markets were enabled to value and select for carbon efficiency associated with sourcing and processing with no changes to actual material use, the resulting GHG reductions would be massive and would exceed the GHG emissions of many countries today. Two events—the recognition of carbon emissions as a risk by capital markets and the technology revolution—present significant opportunities to address emissions at the base of the supply chain. GHG emissions are now being viewed in capital markets as a material risk for businesses, which presents a scalable and apolitical framework to address GHG externalities. For example, the Carbon Tracker Initiative estimates that the amount of CO2 contained in proven fossil fuel reserves exceeds the total allowable amount of CO2 that can be released into the atmosphere by roughly a factor five by 2050. Since fossil-fuel-based companies’ value is derived in large part from their proven reserves, this implies that capital markets are carrying a substantial risk of overvaluation. In conjunction with this correlation, divestment campaigns targeting fossil fuels have led over 400 institutions, representing over $2 trillion in investment, to commit to divestment. While divestment has gained attention and is indicative of the larger issue of carbon risk, questions arise regarding the redeployment of this capital in an efficient and high-impact manner. The emergence of low-carbon ETFs, Green Bonds, and Indices provide additional evidence of the trend. Further, the Norwegian Pension Fund’s move to divest holdings associated with palm oil suggests that institutional investors are now acting to reduce carbon exposure beyond fossil fuel holdings. If capital markets are both deploying advanced analytics and developing products in relation to carbon risk, then an opportunity exists for a mechanism to be introduced enabling the efficient allocation of capital in relation to carbon risk at the base of the global markets. Mobile Technology: Mobile technology has emerged as a primary engine of economic growth, enabling data to be collected everywhere and shared globally, stimulating enormous private-sector spending in both R&D and infrastructure, and profoundly changing individual lives and transforming commerce on a global scale. In the case of the developing world, mobile technology is a pathway to democratizing communication and services such as banking. Blockchain: Blockchain technology, enabling cryptocurrencies such as Bitcoin, creates the possibility of an apolitical global platform for trading and exchanging currencies and commodities. Low transaction costs, financial innovation, and mobile wallets can bring financial tools to the unbanked—including the producers of raw materials who can be financially compensated for adopting sustainable practices. In addition, blockchain technology can incorporate a notary function for immutable and easily auditable record keeping that is critical for our application. The Economist calls it a “Trust Machine,” and the technology is expected to have impacts on par with that of the Internet. Big Data Analytics: Big data is a popular term used to describe the exponential growth and availability of data, both structured and unstructured. Big data analytics is the process of examining, or “mining,” large data sets containing a variety of data types to uncover hidden patterns, unknown correlations, market trends, anomalies, and other useful business information. Global Solution Networks: Emerging networks of civil society organizations, private companies, governments, and individuals enabled by digital technology are achieving new forms of social innovation—advocating for and delivering solutions for global problems. Enabled by the digital revolution, multi-stakeholder, self-governing networks are transforming how we solve global problems—including the development, application, and modification of global standards. Over the previous two decades, numerous instruments have evolved to quantify externalities related to environmental and other impacts. We’ll review the most prominent here. RECs are unitized, serialized environmental commodities representing the generation of one MWh of electricity from renewable energy sources such as wind and solar. RECs are decoupled from electricity at the point of generation and bundled with power purchases or transacted separately. The indirect crediting of RECs is an efficient way to enable the differentiation and pricing of renewable energy without disrupting existing markets or infrastructure. RECs are well-established, cost-effective environmental commodities that are broadly utilized in both compliance and voluntary regimes, but the market for them is limited to electricity. RECs are attributional in nature because the product incorporates specific attributes of the electricity produced, such as generation type, vintage, and location. A carbon offset represents a reduction (or avoidance/removal) in emissions of one metric tonne of carbon dioxide equivalent (tCO2e) created in order to compensate for an emission of one tCO2e made elsewhere. 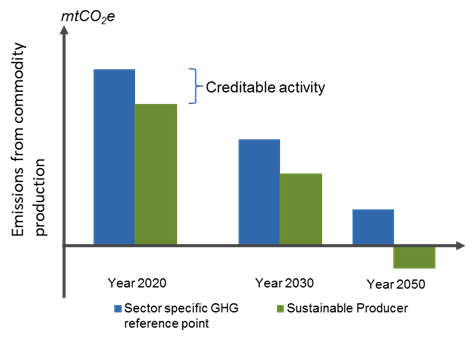 As carbon offsets represent a reduction in relation to another emission, they are predicated on the principle of additionality, meaning that the reduction of one mtCO2e would not have taken place in the absence of carbon finance. To protect environmental integrity, standards and methodologies are developed to help ensure that GHG emissions reductions from carbon-offset projects are real, measured, monitored, reported, verified, additional, and permanent. Additionality, however, is irrelevant when the objective is to manage carbon risk. Rather, the ability to gauge and compare carbon intensity becomes key to decision making. Many sustainability standards and certifications, amounting to approximately 500 “eco-labels,” have been developed and are used by companies to demonstrate performance related to various environmental, social, governance, and ethical issues—and the number of standards is increasing. Compliance with such standards is often voluntary and usually third-party assessed. As a result of the proliferation of standards and eco-labels, efforts are now underway to assess the quality of the standards and eco-labels themselves. ISEAL, which has established a set of principles to ensure that standards and eco-labels are credible, is an example of the trend. In some cases, certification standards can differentiate commodities and the related products—for example, Palm Oil Certificates (Figure 4). While these types of standards can influence market choices, they typically do not provide verified, quantified greenhouse gas emission metrics, and the extensive procedural requirements unique to different industries and geographic regions limit these standards from reaching global scale. Driven by stakeholders and shareholders to demonstrate action, particularly in reducing GHG emissions within the supply chain, and frustrated with the lack of options, multinationals have begun developing direct investments in their supply chains. Direct supply chain investment, known also as “carbon insetting” can be defined as a partnership–investment in an emission reducing activity within the sphere of influence or interest of a company (outside WRI/WBCSD Scopes 1 and 2), whereby the GHG reductions are acknowledged to be created through partnership and where mutual benefit is derived. These proactive steps show that demand for low-carbon measures within the supply chain exists, but insetting can be costly, is inherently discreet and, thus, difficult to scale. Additionally, insetting does not require third-party verification to ensure quality. Regardless of the approach, one attribute is essential to any claim representing an intangible attribute or benefit: integrity. In order to ensure integrity, two things are required: (1) a standard to define a practice, process, or attribute, and (2) verification that the requirements of the standard have been met. To date, integrity has come at the cost of efficiency and scale. A second required attribute is economic viability, which requires efficient allocation of capital within reasonable timeframes. The final attribute is relevance: the solution must be directly aligned with business operations today. International standards provide economic benefits through transaction costs, by improving trade via harmonized technical specifications that assure the safety and performance of products, and by assuring that products are safe. However, most standard development systems require significant cost and time. A typical ISO standard requires 3 to 4 years of development; involves up to fifty experts at international meetings and hundreds of experts for national level meetings; and can cost $1 million a page to develop. In addition, the high cost and long timelines can prevent the right experts from being able to participate in development or review, leading to a lack of credibility in the finished standard. The demand for standards is increasing, exacerbating the lack of access to qualified experts, and resulting in duplication and lack of a standard approach. Any truly effective solution must solve the standard development challenges by creating a globally recognized standard process that is cost effective, engages experts in a timely manner, and involves regular updates. Project versus Production-Based: Carbon offsets are developed as individual projects in which capital outlays associated with credit generation typically occur in advance with the expectation of a return on investment in the future. The return on investment would be in the form of an “annuity stream” from the sale of offsets. This project approach is not easily transferable to production models in which marginal units are produced incrementally, based on marginal returns. Past versus Future: In the case of carbon offsets for compliance markets, issuance takes place long after the project-related emissions reduction activities have taken place, usually from six months to several years later. This is consistent with compliance carbon markets themselves, which are designed in such a way that participants demonstrate compliance at the end of a specified term. This “backward looking” view is antithetical to global markets in general (financial, commodity, or other), which are forward looking in nature. In the case of raw materials, the futures market provides the assurances and facilitates capital flows for producers. Integration of environmental impacts in existing commodity markets will require that they be valued in a manner consistent with the valuing of raw materials themselves. Financial Benefits: Quantifying the benefits of conformance to various sustainability certifications remains a significant challenge—particularly for smallholders or other less sophisticated raw material producers. The biggest challenge to the adoption of low-carbon sourcing and production methods for raw materials is that current approaches are not integrated with commodity markets (Figure 5). The backbone of the commodity market, the futures contract, stipulates desired product attributes for future delivery. By engaging in a futures contract, commodity producers gain price certainty and make more informed production decisions. Incentivizing low-carbon commodity production requires that related carbon externalities be incorporated into commodity markets and aligned with the existing mechanisms for transacting physical commodities. Until this happens, ancillary efforts to address the issue will be insufficient to drive low-carbon commodity sourcing on a global scale. Represent carbon efficiency in relation to an accepted point of reference for carbon intensity within a given sector (enabling fungibility). For example, an industry sector has developed a methodology to quantify GHG emissions and established an accepted reference point of 5 mtCO2e of GHG emissions per unit produced for given Raw Material Input. Raw Material Producer A is verified to utilize processes that result in 4 mtCO2e according to the methodology, resulting in 1 CIF being generated for each unit of production. Represent carbon intensity by input source, enabling direct comparison between specific inputs. As an example, one unit of Raw Material X could have a footprint ranging from about 3 to 20 tCO2. A CIF could be derived from the inverse of the footprint, multiplied by a factor for convenience of use to generate a comparative score. For a unit Raw Material X whose production generates 5 tCO2e, 1/5 x 100 = 20. For a unit of Raw Material X whose production generates 10 tCO2e, 1/10 x 100 = 10. The former results in a CIF score of 20 per unit and the latter in a CIF score of 10 per unit, enabling a direct comparison of carbon efficiency between the two units. These are illustrative examples of how CIF can be applied in global markets to value carbon efficiency; there are likely others depending on sector, processes, and sophistication or accessibility of the technology. CIF is not a carbon offset, nor a carbon inset. It is a measure of carbon efficiency (Figure 6). The unit not only incentivizes the production of each commodity with carbon efficiency as a consideration, but it also incentivizes the selection of commodities with higher carbon efficiency. Because CIF is a dynamic measure of carbon intensity in relation to an accepted point of reference or a direct comparison within a given sector, it can drive compounding benefits over time as carbon efficiency increases—from low(er) carbon to carbon neutral and, in some cases, eventually to carbon negative. There are already examples of very low carbon and carbon negative inputs emerging in GHG intense sectors like cement and polymers. The first step in the CIF system is the creation of globally accepted standards to establish processes and quantification methods. Stakeholders (industry participants, standards body, verifiers, NGOs, and technical experts) utilize global solutions platform to generate a globally accepted standard within a given sector. Figure 7 illustrates the key elements of the CIF System, which are outlined in Figure 8. 1. Individual producer receives certification for raw materials it generates and sends to market Raw material producer undergoes certification to determine the specific GHG impacts of its materials (impact score) in relation to the accepted reference point. The certification is time bound. 2. Materials produced and metrics decoupled Raw material producer generates and ships materials to primary processing point. Logistics data (origin, destination, volume) and impact score are applied against an algorithm prescribed by accepted standard to generate metrics. 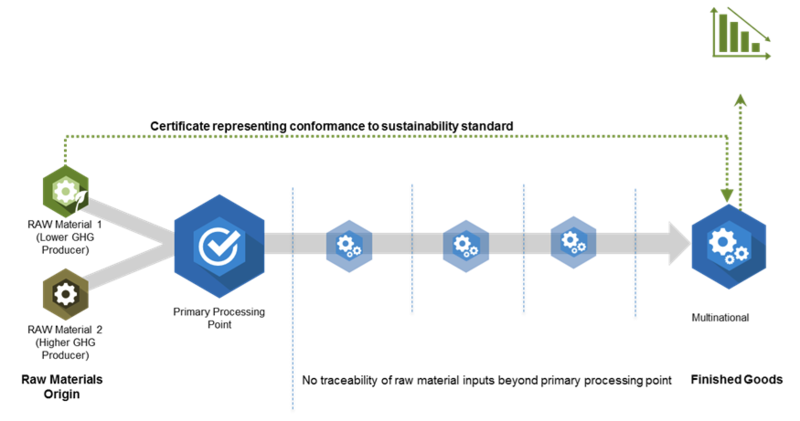 Metrics are decoupled and translated into unitized, serialized data sets (CIFs) representing 1 tCO2e with relevant data (origin, destination, volume, etc.) placed into the producers’ crypto account. 3. Metrics transferred to Finished Goods Seller CIF is transferred to Finished Goods Seller’s crypto wallet. 4. Market values metrics and ecosystem is paid Commodity trader receives payment for CIF. Payments from commodity trader can be made in cryptocurrency and instantly transferred to ecosystem participants’ crypto wallets, in accordance with pre-existing contracts, while all remaining value is transferred to the producer’s account. Ecosystem participants include standards body, verification providers, methodology developers, supporting NGOs, and reporting frameworks. 5. Finished Goods Seller retires metrics, makes claim Finished Goods Seller retires CIF units such that they cannot be transferred to any other crypto account and reports to GHG reporting body and/or other stakeholders. Retired units can be visible to ensure integrity. Ecosystem participants receive payment in cryptocurrency and then exchange it back into their local fiat currency. Commodities delivered to market by the producer continue to produce CIFs, being monitored by third-party data (satellite or GPS; industry reports; sales; government; and public databases are used to identify anomalies in metrics generations). Any anomalies are investigated in depth to ensure the integrity of the system. Externalities associated with commodity extraction or production are separate from the materials themselves and cannot be detected or traced once the materials enter an undifferentiated flow. Thus, any claims or information associated with the extraction or production of material must be verified to be in conformance with a globally accepted standard that is, itself, produced in accordance with a globally accepted standard framework governing the development, use, and management of standards. An integrated ecosystem for standards certification to support global market functions for externalities requires that standards be developed by experts across international boundaries who adhere to professional governance and are incentivized to participate. The experts must be able to collaborate openly to foster knowledge creation and expedite quality, which requires access to relevant data and metrics and the tools to translate data into intelligent decisions. The evolution of Global Solutions Networks (GSNs) empowered by information and communication technology enables the rapid and low-cost development of (1) global standards to quantify the carbon intensity of practices and materials for raw material inputs by sector, (2) the framework to ensure consistent and compatible standardswithin an interoperable system, and (3) the resources to apply the standards for quantification and decision making, as well as assurance credibility. Support for assurance of reports and claims, thus reducing time and cost. The application of technology in the creation and maintenance of global standards enables the uniformity and assurances required by markets. The initial audit inspects producers’ extraction or production methods to ensure they have the systems and procedures in place that comply with the globally accepted standard for low-carbon production and that data generation and reporting mechanisms are sufficient to support ongoing validation. This is not a verification of data or an assessment of the implementation of a practice that is equivalent to the concept of verification in today’s carbon offset markets. Rather, this step validates that the systems and processes at the raw material producer conform to global standard criteria. During ongoing validation, data sources will be mined to detect anomalies in reporting from CIF ecosystem participants. Data sources will include production data, government and industry group data, satellite data and imagery, and automated purchase and delivery ledgers. The data will be analyzed using computer-based algorithms and big data analysis techniques. Audits will occur both in the case of detected data anomalies and on an ongoing basis. The ongoing audits will be derived from a risk-based assessment. The new verification model will be closely aligned with commodity “production” rather than the current project-based approach associated with carbon offsets. Once a raw material producer is validated to conform to the standard in an initial audit, all production that follows will generate CIFs in conformance with the applicable methodology on an ongoing basis for the term defined by the standard. Big data generated by third parties can then be analyzed. 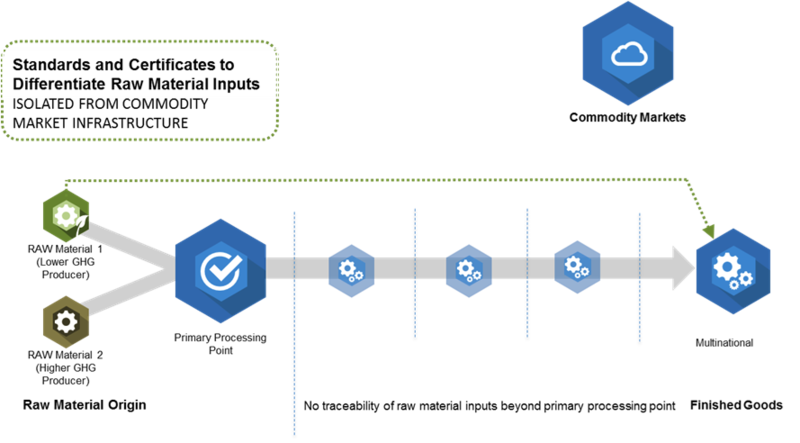 Spot audits can be carried out to ensure continued conformance with the standard, but, to the extent possible, data capture and analysis will be automated. Technological advances make this increasingly feasible. For example, remote sensing technologies can be both more accurate and timelier than measurements taken manually and only at a discrete point in time. Once standards and validation processes are in place, data can be applied to an algorithm prescribed by the methodology to quantify carbon intensity. The data generated can be seamlessly shared with and incorporated by both voluntary (CDP, SASB, etc.) and regulatory (national, subnational) GHG reporting frameworks to demonstrate carbon efficiency (reduced risk) as well as compliance with carbon reduction measure. As noted, the allocation of financial capital for intangibles like carbon impacts at the base of the supply chain is either nonexistent or inefficient within environmental commodity markets today. The emergence of blockchain technology provides an opportunity to efficiently allocate financial capital across the ecosystem while simultaneously ensuring that the value created through CIF generation cannot be exploited through double counting. Blockchain technology enables the encryption of all relevant data required for CIF generation in a data set that can only be held by a single entity at a given moment in time, while making the CIF’s entire history transparent. The blockchain would track a CIF from the point of creation and enable its retirement to prevent subsequent use (“irreversible corruption”). Upon availability to the commodity marketplace, CIFs can be exchanged as a globally recognized crypto-asset that trades on multiple cryptocurrency exchanges. 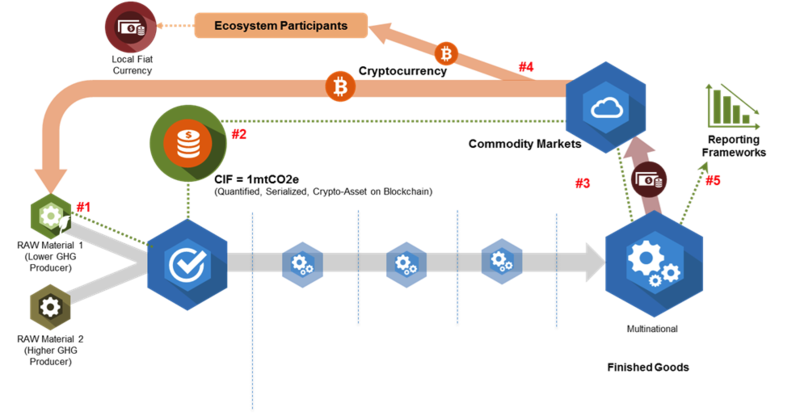 CIFs have the potential to become the “currency of carbon efficiency” or in blockchain terminology, “proof of efficiency.” CIFs can be transferred directly to ecosystem participants’ cryptocurrency wallets in accordance with contracted terms. Alternatively, ecosystem participants can chose a crypto-aware financial institution to convert their CIFs to bitcoin or to their local fiat currency. Blockchain technology is used to efficiently track CIFs as they move downstream from the producer and bitcoin (or other globally accepted cryptocurrency) can be used to quickly and efficiently pay the network of globalized (potentially small holder or unbanked) producers who lack the ability to engage in sophisticated OTC credit transactions, wire transfers, and currency exchanges. In a world with a scientifically defined carbon budget, carbon inefficiency will not be tolerated. Recent developments in the capital markets are indicative of this trend, but it is still early. Carbon efficiency will increasingly become an economic and strategic imperative, and only the most carbon-efficient resources will be consumed, forcing the differentiation of raw material inputs (oil, natural gas, steel, palm oil, cement, refrigerants, etc. ), including the variable aspects of carbon intensity related to production and sourcing. The differentiation of previously undifferentiated materials in global markets poses a challenge, but also provides an opportunity. Even in a scenario with a binding international agreement on climate change, CIF provides a foundational financial instrument to store and value carbon efficiency within the infrastructure of global commodity markets. Further, by focusing on raw material inputs at the base of the global supply chain, CIF is complimentary to national, subnational, and corporate efforts, enabling a cost-efficient way to harness the power of the market economy to rapidly deploy capital toward increasingly carbon-efficient practices that minimize risk. By linking institutional investors’ desire to minimize risk (through data transparency and integrity) with the desire of raw material producers to maximize value (through direct access to market demand), an economically viable self-reinforcing system emerges as a solution for carbon efficiency. The authors would like to thank Karl Burkart, Dirk Forrister, Kevin Fay, Bernard Lietaer, Micah Winkelspecht, Martin Lagod, Bill Collins, Hunter Lovins, Patrick Pfeiffer, Richard Sandor, Mark Campanale, Alex Rau, Andrew Pisano, John Melby, Stan Stalnaker, Pedro Faria, Nigel Topping, Stephen Donofrio, Stephen McComb, Tim Juliani, Nick Aster, Dimitar Vlahov, ACR leadership, Steve Polski, Laura Prisbe, Erika Anderson, Eron Bloomgarten, and John Kadyszewski for their feedback in developing the concept and/or support in reviewing the document. Bitcoin A type of digital currency in which encryption techniques are used to regulate the generation of units of currency and verify the transfer of funds, operating independently of a central bank. Big Data A broad term for data sets so large or complex that they cannot be adequately analyzed by traditional data processing applications. Blockchain A distributed database of cryptocurrency transactions and account balances. “The Blockchain” refers to the Bitcoin blockchain, but there are other cryptocurrencies with their own blockchains. Crypto-Asset A crypto-asset is a digital asset that is stored and transferred on a blockchain. It is different from a cryptocurrency in that it is intended not for use as a currency for general transaction but to represent an asset digitally. Crypto-assets may represent dollars in a bank account, gold in a warehouse, or an environmental asset like CIFs. Crypto-Wallet A digital keychain. The wallet contains the private keys that can be used to spend the cryptocurrencies owned by the holder. The wallet holder has the keys to spend the coins they own. INDC Countries across the globe committed to create a new international climate agreement by the conclusion of the United Nations Framework Convention on Climate Change (UNFCCC) Conference of the Parties (COP21) in Paris in December 2015. In preparation, countries have agreed to publicly outline what post-2020 climate actions they intend to take under a new international agreement, known as their Intended Nationally Determined Contributions (INDCs). The INDCs will largely determine whether the world achieves an ambitious 2015 agreement and is put on a path toward a low-carbon, climate-resilient future. ISEAL Global membership association for sustainability standards. The mission of ISEAL is to strengthen sustainability standards systems for the benefit of people and the environment. Scope 1 Emissions are direct emissions from owned or controlled sources. Scope 2 Emissions are indirect emissions from the generation of purchased energy. Scope 3 Emissions are all indirect emissions (not included in scope 2) that occur in the value chain of the reporting company, including both upstream and downstream emissions. Carbon Tracker. 2013. “Things to look out for when using carbon budgets!” Carbon Tracker Initiative (October). Available from http://www.carbontracker.org/wp-content/uploads/2014/08/Carbon-budget-checklist-FINAL-1.pdf. United Nations. 2009. Copenhagen Accord. UN Framework Convention on Climate Change (PDF: 18 December). Accessed 14 October 2015. Available from http://unfccc.int/resource/docs/2009/cop15/eng/l07.pdf. Leaton, James (on behalf of Investor Watch). 2011. “Unburnable Carbon: Are the world’s financial markets carrying a carbon bubble?” Carbon Tracker Initiative. PDF. Available from http://www.carbontracker.org/wp-content/uploads/2014/09/Unburnable-Carbon-Full-rev2-1.pdf. For example, see: http://www.wri.org/our-work/topics/indcs and http://www.wemeanbusinesscoalition.org/about. The Paris Agreement under United Nations Framework Convention on Climate Change. December 12, 2015. “Adoption of the Paris Agreement.” Draft decision-/CP.21. http://unfccc.int/resource/docs/2015/cop21/eng/l09.pdf. Scott, Mike (for CDP). 2015. “The Forgotten 10%: Climate Mitigation in Agricultural Supply Chains.” CDP (September). Accessed Oct. 14, 2015. Available from https://www.cdp.net/Documents/climate-mitigation-in-agricultural-supply-chains.pdf. Gordon, Deborah, Adam Brandt, Joule Bergerson, and Jonathan Koomey. 2015. Know Your Oil: Creating a Global Oil-Climate Index. Washington, DC: Carnegie Endowment for International Peace. Accessed PDF November 4, 2015. Available from http://carnegieendowment.org/2015/03/11/know-your-oil-creating-global-oil-climate-index. McGill, Alan. 2011. “Puma’s Reporting Highlights Global Business Challenges.” PwC World Watch 3. Accessed November 4, 2015. Available from http://www.pwc.com/gx/en/audit-services/corporate-reporting/sustainability-reporting/assets/pumas-reporting-highlights-global-business-challenges.pdf. Velders, G. J. M., S. Solomon, and J. S. Daniel. 2014. “Growth of climate change commitments from HFC banks and emissions.” Atmos. Chem. Phys. 14: 4563–4572. U.S. Energy Information System. International Energy Statistics. Available from http://www.eia.gov/cfapps/ipdbproject/IEDIndex3.cfm?tid=3&pid=3&aid=8. World Steel Association. “Steel’s contribution to a low carbon future and climate resilient societies.” Available from http://www.worldsteel.org/publications/position-papers/Steel-s-contribution-to-a-low-carbon-future.html. World Business Council for Sustainable Development and International Energy Agency. 2009 (U.S.2012). “Cement Technology Roadmap; Carbon emissions reductions up to 2050.” GHG Inventory. Smart, Lauren. 2015. “Carbon Risk: How do we measure and manage it?” The Actuary (June). Available from http://www.theactuary.com/features/2015/06/carbon-risk-how-do-we-measure-and-manage-it/. Leaton, “Unburnable Carbon.” Accessed Oct. 8, 2015 from http://www.carbontracker.org/wp-content/uploads/2014/09/Unburnable-Carbon-Full-rev2-1.pdf. Carrington, Damien, and Emma Howard. 2015. “Institutions Worth $2.6 Trillion Have Now Pulled Investments Out of Fossil Fuels.” The Guardian (September 22). Available from http://www.theguardian.com/environment/2015/sep/22/leonardo-dicaprio-joins-26tn-fossil-fuel-divestment-movement. BlackRock. 2015. “iShares MSCI ACWI Low Carbon Target ETF.” Available from https://www.ishares.com/us/products/271054/ishares-msci-acwi-low-carbon-target-etf. FTSE. FTSE CDP Carbon Strategy Index Series. Available from https://www.cdp.net/en-US/Respond/Documents/FTSE%20CDP%20Methodology%202-sider.pdf. An example can be can be seen in the Norwegian Pension Fund’s recent decision to divest its holdings in both Posco, the Korean conglomerate that owns Daewoo, and Daewoo, which owns the Indonesian company, PT Bio Inti Agrindo, a palm oil producer associated with deforestation. See “Norway Fund excludes Four Asian Groups.” 2015. The Financial Times. Available from http://www.ft.com/intl/cms/s/0/b8305bbe-44c7-11e5-b3b2-1672f710807b.html#axzz3r7DAXB5B. Bezerra, Julio, W. Bock, F. Candelon, S. Chai, E. Choi, J. Corwin, S. DiGrande, R. Gulshan, D. C. Michael, and A. Varas. 2015 “The Mobile Revolution: How Mobile Technologies Drive a Trillion-Dollar Impact.” bcg Perspectives. Available from https://www.bcgperspectives.com/content/articles /telecommunications_technology_business_transformation_mobile_revolution/. Investopedia. “Cryptocurrency.” Available from http://www.investopedia.com/terms/c/cryptocurrency.asp?optm=sa_v2. “The Trust Machine: the promise of the blockchain.” 2015. The Economist (October 31). Available from http://www.economist.com/news/leaders/21677198-technology-behind-bitcoin-could-transform-how-economy-works-trust-machine. Letouzé, Emmanuel (developed by UN Global Pulse). 2012. Big Data for Development: Challenges & Opportunities. Available from http://www.unglobalpulse.org/sites/default/files/BigDataforDevelopment-UNGlobalPulseJune2012.pdf. Tapscott, Don. 2013. Global Solutions Networks. Available from http://issuu.com/globalsolutionnetworks/docs/introducing-global-solution-network/1?e=9482313/6974754. .Big Room Inc. Ecolabel Index. Available from http://www.ecolabelindex.com. Rural Infrastructure and Agro-Industries Division (AGS); Food and Agriculture Organization of the United States (FAO). 2013. “Voluntary Standards: Impacting Smallholders’ Market Participation.” Policy Brief (July). Rome, Italy: AGS and FAO. Available from https://unfss.files.wordpress.com/2015/10/fao-publication-on-impact-of-vs-on-smallholders.pdf. Roundtable on Sustainable Palm Oil (RSPO). 2015. “About Us.” RSPO. Available from http://www.rspo.org/about. May-Tobin, Calen. 2013. “What’s in a Name? Why the RSPO’s Definition of “Sustainable” Falls Short.” Blog: The Equation (September 19). Union of Concerned Scientists. Available from http://blog.ucsusa.org/calen-may-tobin/whats-in-a-name-why-the-rspos-definition-of-sustainable-falls-short-248. Tipper, R., N. Coad, J. Burnett; reviewer: M. Brander. 2009. “Is ‘Insetting’ the New ‘Offsetting’?” Technical Paper TP‐090413‐A. Ecometrica Press. Available from http://ecometrica.com/assets/insetting_offsetting_technical.pdf. International Organization for Standardization (ISO). Available from http://www.iso.org/iso/home/standards_development.htm. AGS; FAO, “Voluntary Standards.” Available from https://unfss.files.wordpress.com/2015/10/fao-publication-on-impact-of-vs-on-smallholders.pdf. Reijnders, L., and M.A.J. Huijbregts. “Palm oil and the emission of carbon-based greenhouse gases.” 2008. Journal of Cleaner Production 16(4): 477–482. Available from http://www.sciencedirect.com/science/article/pii/S0959652606003593. VHSC. “PozzoSlag.” Available from http://www.pozzoslag.com. Newlight Technologies. Available from http://newlight.com. Aligned with the new ISO 14080 Guideline—Framework with Principles for Methodologies on Climate Actions. Baumann, Tom; Stephanie Powers, Francisco Fraga, Sandra Odendahl, Angela Baker, Brendan Guy, Jacob Scherr, Spencer Schecht. “Climate Change.” 2015. In Global Network Solutions Summit 2015: Applying New Models of Global Problem Solving and Governance (February 19–20): 10. Available from http://gsnetworks.org/wp-content/uploads/GSN-DC-Summit-Report.pdf.